In All Hat, No Cattle, Trevor Baird and Simone Blain use open-ended narratives to balance diligent, ordered forms in repetition. 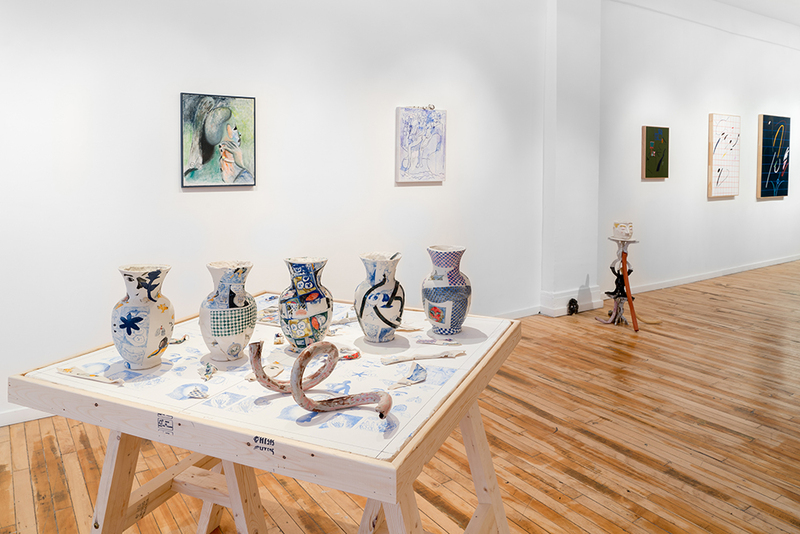 In this exhibition of ceramics and paintings, their works inhabit a muddy space where naïve and pretty commingle in an attempt to push the boundaries of what is tasteful. As patterns build, naively drawn figures shift and become at once embarrassed and robust. Tests and scraps are recycled and reorganized to create a body of work that marks time and persistence; visual cues not only showcase mistakes but also indicate where marks have been covered up or erased completely. Resourcefulness exists in tension with formal considerations of colour, line and texture, to create awkward objects that skirt the rules of what constitutes fine art. Recurring characters are placed as stand-ins for personal projections and ideas, with reduced facial expressions that attempt eye contact, but end up cross-eyed. 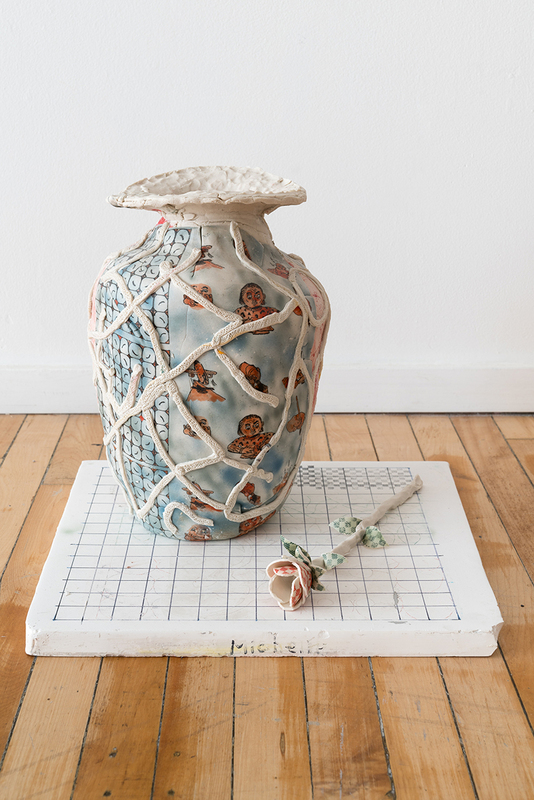 From a cache of personal drawings and pictures, Trevor Baird creates ceramic works by imprinting images and patterns flat on plaster. His work relies heavily on the histories of function, decoration, labour and temporality. Working initially with comics and image-based narratives, the shutting off and finality of a book or flat image caused him to look for a way to decontextualize and open an image while continuing to hold or create narrative possibilities. Repetitive silk screening creates detailed copies of poor images, tenderly painted like watercolours. Layers build up backwards before they are transferred to wet clay, to be folded and forced into shape. 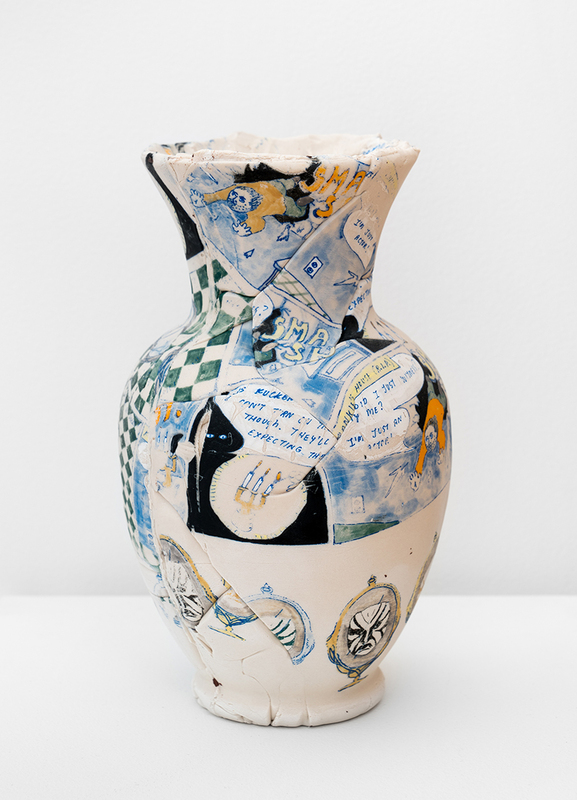 Taken from what can be found on Google under “generic Glass Vase” many of his works begin to represent the western postmodern image of pottery. Distilled for no obvious reason, they become unobstructive, merging utility and elegance into an ambiguous 3D form. 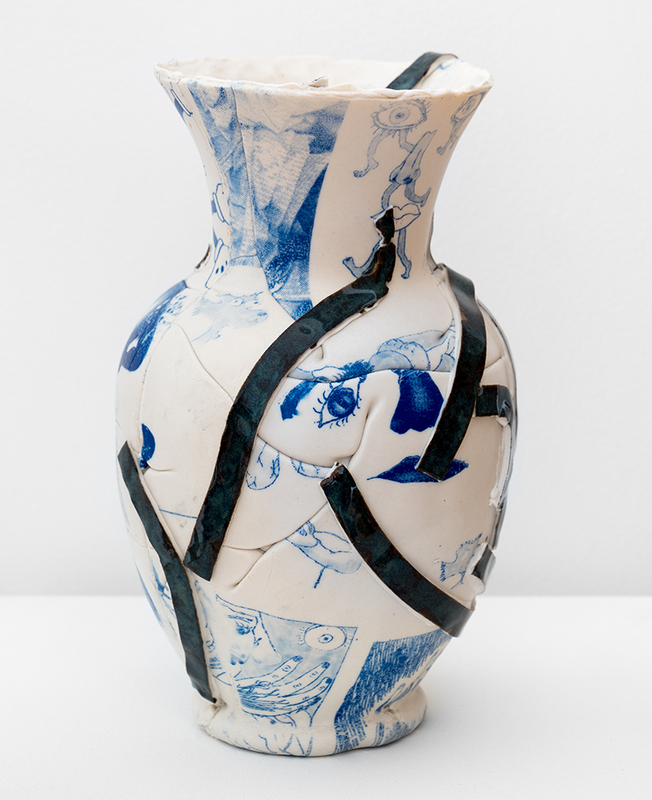 Bending, ripping, breaking, folding and cutting, the clay takes an outer industrial form while retaining human touch. The shape of the vase made in porcelain is an attempt to heighten the importance of the imagery through worth, a push/pull between low and high culture as well as labour, value, and class. 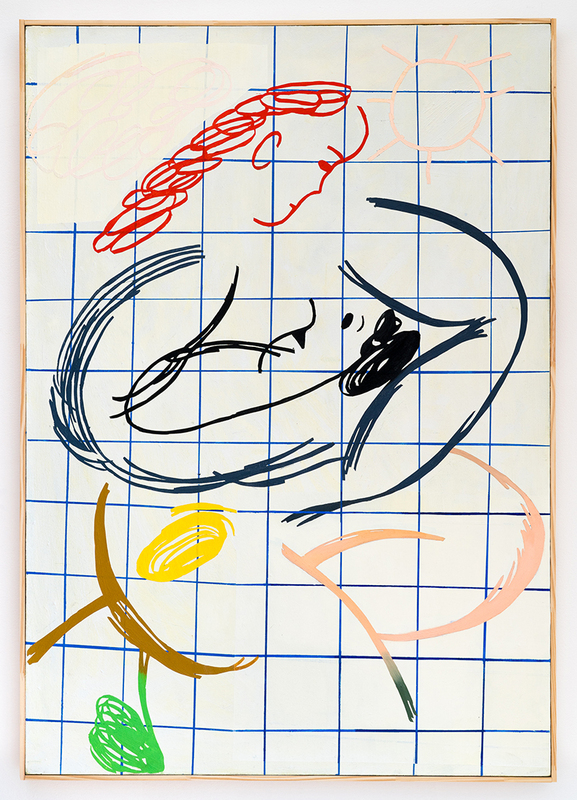 Simone Blain’s paintings focus on the vernacular, mundane world of human relationships, using a tongue-in-cheek childlike approach with a direct and pared down drawing style, rendered in paint. 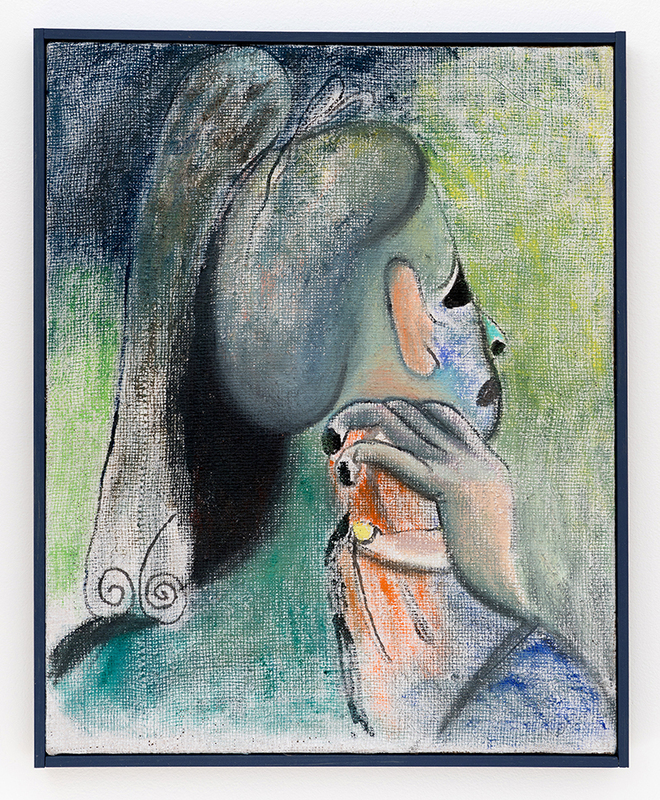 Her work uses humour as a mechanism to speak about sentimentality, heartbreak and romance. 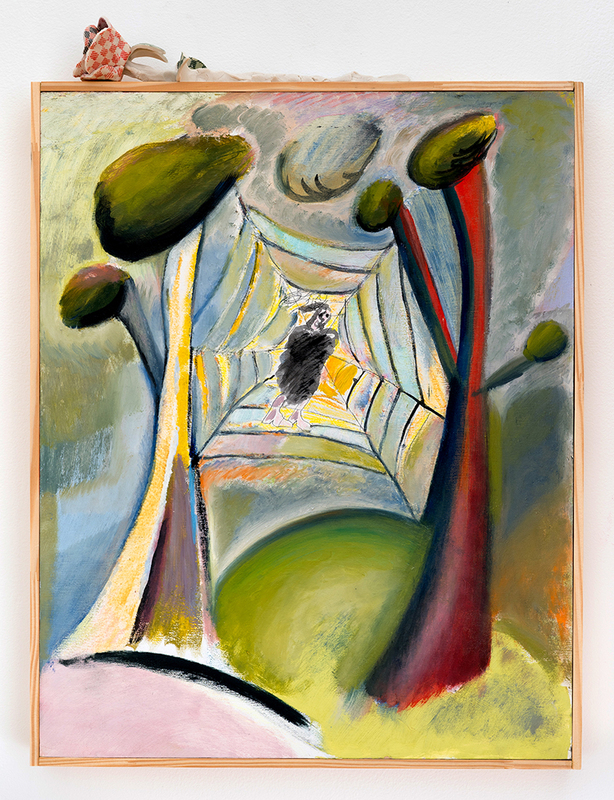 Inspired by the quotidian, Blain gathers source material in such a way that echoes her hyperactive tendency to record her surroundings visually. 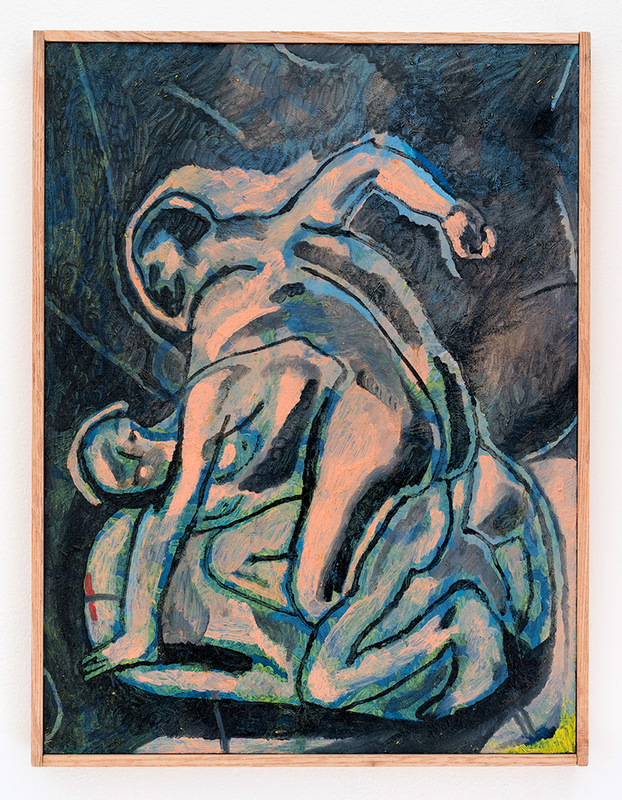 Many of the formal considerations in Blain’s recent paintings are drawn from traditional textiles and craft, or photographs that she collects daily on her cellphone. Frequently employing devices such as repetition of form and texture, colour and composition, her paintings strive for sense of rhythm. Blain’s process is slow, lines build up on the surface in layers. She cuts away strips of painter’s tape to reveal a subtle relief of paint upon the canvas, producing an image that is at once meticulous and casual. Trevor Baird was born in Vancouver in 1990, he currently lives and works in Montreal. He holds a BFA with a major in ceramics from Concordia University. He has shown in Canada and Mexico City through Galerie Projet Pangée and has been featured in print in The Editorial Magazine (Montreal), FREAKER UNLTD 1-3 (Vancouver), and others. Simone Blain was born in Fredericton in 1990, she currently lives and works in Montreal. She holds a BFA in Painting and Drawing from Concordia University. Her recent exhibitions include RMBA at Centre Phi (Montréal), Got it For Cheap at the Steinsland Berliner Gallery (Stockholm) and DISCOMFORT, COMFORT at the galerie The Silent Barn (Brooklyn). Her work was published in The Editorial Magazine (Montréal).